In the late summer of 1966, Jones and Nina, now married at Rudi's request, moved to Philadelphia so he could enroll at a Lutheran seminary. Jones doesn't make clear in the first edition of The Knee of Listening why he left Rudi, but in a later edition he says that Rudi sent him to the seminary after speaking with his father. In his youth, Jones had been an acolyte in a Lutheran church, so that may have been a reason, but he had long since fallen away from Christianity. But also, spiritual teachers sometimes do send their students away when they can learn no more from them, but usually this is after many years of study. That it happened after only a year-and-a-half suggests that perhaps Rudi wanted to get rid of him. As Rudi said, "A teacher who is in personal conflict with a student should release the student for both their sakes. Teaching should be a harmony of learning between teacher and student." Certainly Jones was a handful. Not only highly intelligent and well-educated, Jones claimed that since infancy "I have always been Seated in the 'Bright.'... Even as a little child I recognized It and Knew It, and my life was not a matter of anything else." Jones, for his part, saw Rudi as "a kind of super-parent." He says his family, which from his description sounds rather dysfunctional, rejected his experiencing of the "Bright." Later on, he writes that "my own ordinary tendency was to seek a loving connection on which I could become dependent. Where love was not poured on me, I tended to become angry and resentful. But Rudi used, and even intentionally stimulated, these tendencies in me." In the spring of 1967, while at the seminary, Jones suffered what doctors diagnosed as an anxiety attack, but he believed it was a crisis in which he had died. Because of Rudi's stress on the practice of self-observation (oddly, the fundamental practice of self-remembering, embodiment, is never mentioned either by Jones or Rudi in any of their books), Jones believed he had observed his own death. This experience validated his belief that the fundamental dilemma of all human seeking and suffering was that of a separative and narcissistic avoidance of relationship with "the unqualified state of reality." Finding his superiors at the seminary didn't agree with him, he then joined the Eastern Orthodox Church with the idea of becoming a priest, only to learn that an ancient canonical law prevented a man from becoming a priest if he is married to a divorced woman, as Nina was. The religious avenue blocked, he and Nina returned to New York in the fall of 1967. He spoke to Rudi about what he took to be the death in him of Narcissus, but he says Rudi also "tended to interpret my seminary experience negatively." Thereafter, if not before, he increasingly became aware of what he considered Rudi's limitations. He found Rudi's conversation "a constant stream of strongly communicated moods, alternating between talk of Spiritual life, his experiences in India, his Spiritual experience and visions, and the perpetual absorption in business. His business was his principal Yoga. And if you did not know or accept this about him, you could become angry at what appeared to be his perpetual concern with business and the store." Jones came to believe that "Rudi was not himself prepared (ultimately and perfectly) to liberate others, or to bring anyone to any truly high or otherwise ultimate Realization." One day at Rudi's store Jones found some pamphlets of Rudi's guru, Baba Muktananda. He was determined to get to India once he read that Baba maintained "Spiritual life is not a matter of egoic effort on the part of the disciple. It is a matter of the Guru's grace, the Guru's free gift. The disciple needs only to come to the Guru and enjoy the Guru's grace. It is as easy as flowers in sunlight." Learning that he and Nina could receive a 90% discount in airfare after he earned a two-day vacation, he got a job with Pan American Airways. He traded four days off with some fellow workers so that he would have six days in all to travel to India and back. In April 1968 he and Nina went to Baba's ashram at Ganeshpuri, a few hours drive from Bombay. He meditated and chanted and listened to Baba's dialogues (all translated, for Baba spoke only Hindi) and had many kundalini experiences, visions and the like. But Jones wasn't satisfied. With typical intensity he said, "When the last day arrived, I was desperate. I had come for more than this. I had come for everything!" A seemingly endless revelation of the forms of spiritual reality.... I was already becoming aware of the inconclusiveness of all such experiences. Once the problem of the mind had ceased to endear me, I began to intuit spiritual forms. Then I acquired a new problem. The problem of spirituality. The matter of freedom and real consciousness seemed somehow to depend on the attainment of spiritual experience. Spiritual experiences of an ultimate kind seemed identical to freedom and reality itself. Thus, I was driven to acquire them.... I began to feel: 'This is not the point. This is not it. Reality is prior to all of this. Reality is my own nature." But the more this feeling arose in me the more aggressively these experiences arose so that I again began to feel trapped. I felt as if my true path was not Baba's Siddha Yoga. He rarely went out, but would occasionally go for walks with Lucanias. "One day he called me and told me he was going to leave for India for good," Lucanias says. " He and Pat and Nina. That was it, he was just leaving the country. I remember him saying, 'What the hell am I going to do in this place? The hell with it all. I've had it.'" And so at the end of May 1970 he and Nina and Pat left to return to the ashram and, as he says, "I intended to place myself at Baba's feet, to give him my household and my life." At the ashram he was given the work of editing and refining the English translation of Baba's new book, while Nina typed the edited manuscript and Patricia cleaned rooms. For Jones, there was a noticeable change at the ashram, which had become very public and busy. It was crowded with Americans and Europeans. People had Shakti experiences, but didn't seem radically changed by it. Baba seemed to ignore him and, as he says, "never said a personal word to me." Besides the editing, Jones also worked in the garden, where one day the Virgin Mary appeared to him. During the next two weeks she made many appearances. Finally, she told him to leave and to go on a pilgrimage to the Christian holy places in Jerusalem and Europe. Swami Nityananda, Baba's long deceased guru, also appeared to him and blessed him and told him that he belonged to the Virgin now and should do as she said. After a stay of little more than three weeks, Jones and the women left the ashram to take a pilgrimage to the holy shrines of the West. That August, returning to the United States, they settled in Los Angeles. "I no longer practiced in relationship to any of my human teachers," Jones says. "Their teachings had been exhausted in me, until there was no more seeking.... I was simply and directly devoted to the perfect Enjoyment of unqualified Reality, the Very (and unmoving) Self." In late August he began to visit the Vedanta Society temple in Hollywood. There the Divine Shakti appeared in person, he said, and they combined "with One Another in Divine (and Motionless and spontaneously Yogic) 'Sexual Union.'" One day in early September, awaiting her appearance at the temple, he says he suddenly "realized that I had Realized. The 'Thing' about the 'Bright' became Obvious. I am Complete. I am the One Who Is Complete." A month later, in early October, Baba had come to California. He was in the midst of his first world tour, which was largely underwritten by Rudi. Jones reconciled with Rudi and, in the company of a small group, told Baba about what he had realized at the temple. A discussion of Consciousness followed. Jones, who had apparently not seen the blue pearl that was the keystone of Baba's experience and teaching, maintained that pure consciousness "was not settled in the sahasrar (top of the head), or in any other extended or functional level of the body-mind itself, but in the True Heart Itself#151;not the heart chakra or the physical heart, but the Heart of Real Consciousness." By this he seemed to mean that it was not located in some part of the body, but the body-mind when consciously realized appeared in the Heart which was the fullness of life itself, but what he said wasn't as clear. From Jones' report of the meeting, Baba didn't recognize this distinction and so continued to speak about the stabilization of attention being in the heart or the sahasrar, with Jones continuing to maintain that he had not been referring to where attention was centered but to that perfect Realization that transcended attention itself, with the implication that he had realized it. In Baba's reply Jones felt that there "was even an underlying suggestion that those who professed attainment must be regarded with suspicion." Unperturbed, Jones pressed forward, speaking of Reality as prior to and transcending all phenomenal experience. Baba cut him off, saying that such a way does not lead to the highest Truth. "You are present as form. Why do you seek a way without form?" demanded Baba. Jones felt Baba did not understand him. As Jones expressed it later, "There was (from my point of view) no 'personal' disagreement between Baba and me. It was only that Siddha Yoga (and even every kind of Yoga) had been truly Completed in me, and I was drawn into the Absolute Knowledge that is the true, most ultimate, and inherently most perfect Fulfillment of every way and every kind of Yoga proposed in the 'great (and always seeking) tradition' of mankind." 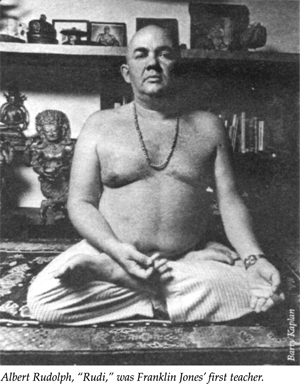 Jones opened an ashram-bookstore in Hollywood, California, with the financial help of Sal Lucanias. He adopted the style of Indian gurus, speaking from an elevated chair, the room laden with colorful carpets, and flowers and incense in abundance. He taught in the Indian tradition, his talk formal and somewhat stilted, and the kundalini power ever emanating from him. Quickly gathering devotees, he created his church, which he called The Dawn Horse Communion, later known as The Free Daist Communion and today as Adidam. He began writing his spiritual memoir, The Knee of Listening: The Early Life and Radical Spiritual Teachings of Franklin Jones. Alan Watts was among those to whom the completed manuscript was sent for a testimonial. Though Watts, a former minister and a leading light of the New Age who had been instrumental in helping to introduce Zen Buddhism to America, had never met Jones, he was enthusiastic. "It is obvious," he wrote, "from all sorts of subtle details, that Franklin Jones knows what IT's all about... a rare being." The book was published in July 1973, just before Jones was to travel to India to see Muktananda. Earlier that April, Jones had told his devotees he would soon take another pilgrimage to India. "Just as there is a vast spiritual process behind this work and all true spiritual work," he explained, "there are also certain individuals, Siddhas and others, who are very directly involved with our work. Muktananda is the only one alive in the body, and it is very important that I purify my connection with him for the sake of the work itself." Strangely, given the lack of agreement in their 1970 interchange, Jones' idea of purifying their connection was to ask Muktananda to give him formal recognition of his realization of Maha Siddha, which, in effect, would make his realization equal to that of Muktananda's. To structure the conversation, Jones wrote four questions that were a continuation of their previous dialogue, which in a yogic way was reminiscent of medieval theologians debating how many angels could stand on the head of a pin. The questions were translated into Hindi and given to Muktananda before they spoke. A tape recording was made that was later published as "A Confrontation of Dharmas" in Jones' magazine The Dawn Horse. The image of the dawn horse had appeared to him on a deep, subtle level that he felt was archetypal and he made it his own ever after. Jones' first two questions dealt with whether the experiencing of consciousness by the jnanis, the sages, was the same as what yogis call Maha-Shakti, and whether consciousness is stabilized in the sahasrar, as Muktananda held, or on the right side of the heart as Ramana Maharshi had said. Muktananda prefaced his answer by warning Jones that he had the habit of talking candidly, so he hoped that Jones wouldn't think he was trying to hurt his feelings, but "if you wish to know the secrets of the scriptures, then your attitude must be appropriate." With that as the context, Muktananda then introduced the question of the duality between the seer and the seen. Are they the same or different? The two, Jones answered, conventionally speaking, are simply modifications of one Reality. Muktananda, pressing the point, asked are they the same Reality, or two different forms? The latter, Jones said. They are the same, Muktananda declared, and told him "I will explain it to you." Saying that while the means are different the experience of a jnani and a yogi are identical. "Only a kindergarten student of Vedanta," Muktananda replied, "holds the notion that the mind is form. One who thoroughly understands Vedanta realizes the mind is not only mind; the mind is nothing but the Lord."